Children from Pathfinders Day Nursery joined forces with residents at Bilton House for the poppy painting session, which supports the theme of this year's gardening contest - the centenary of the end of the First World War. 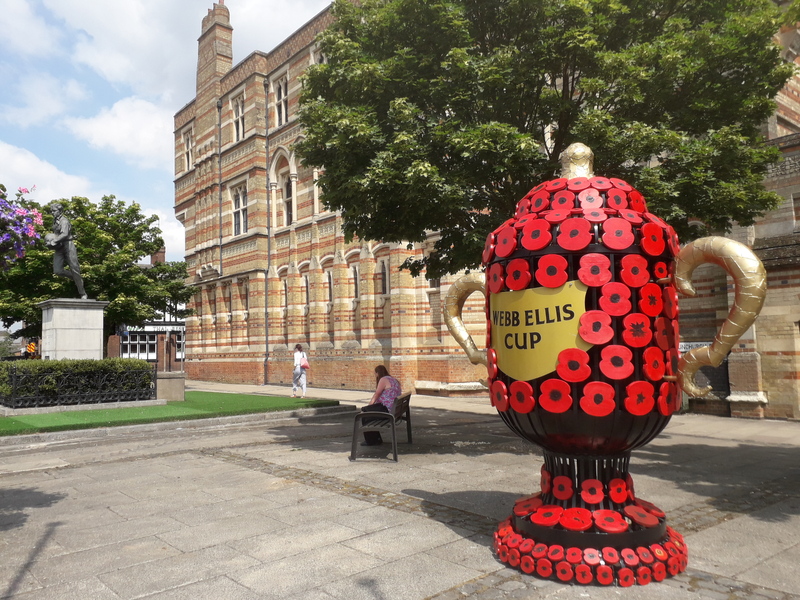 The council has created hundreds of wooden poppies to adorn the replica Webb Ellis Trophy ahead of its return to Dunchurch Road, overlooked by the statue of William Webb Ellis. And Rugby Art Gallery and Museum's arts development team has recruited a team of poppy painters to decorate the wooden blooms, working with organisations such as Age UK's Claremont Centre, Works 4 Me and Express, the Benn Partnership Centre's art group. Rachel Ward, deputy manager at Pathfinders Day Nursery, said the children had become regular visitors to Bilton House as part of the nursery's intergenerational work. "The children and residents have built strong bonds, and the joy and excitement seen from all during these visits is fantastic,"
Cllr Lisa Parker, Rugby Borough Council portfolio holder for environment and public realm, joined the children and residents at Thursday's (21 June) poppy painting session. "Rugby in Bloom creates a fantastic community spirit every year as we all work together to help make the borough look its best. "It's no surprise so many community organisations have embraced the poppy painting project to support this year's entry, and we're looking forward to unveiling the poppy covered Webb Ellis Trophy next month."